Why President? How The U.S. Named Its Leader On this Presidents Day, we dig into why the United States calls its leader the "president." 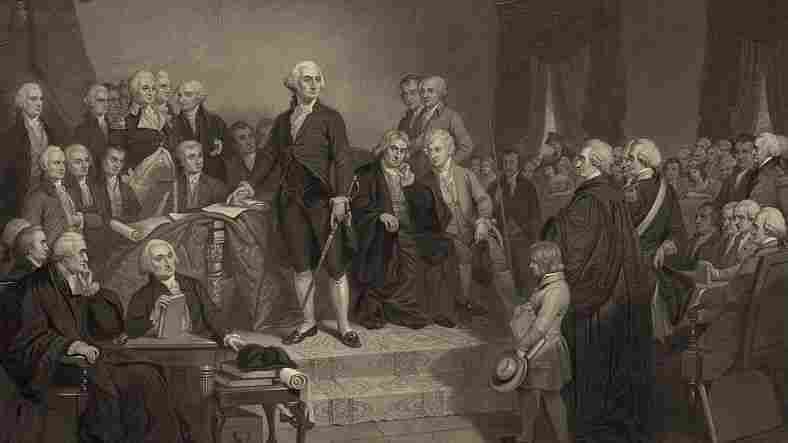 George Washington delivers his inaugural address in April 1789. "It comes from 'praesidere,' which literally means 'to sit before,' " says linguist Ben Zimmer, executive editor of Vocabulary.com. "It referred to an officer who would sit before a gathering and would serve as the presiding officer." At the time, the word was generally used kind of like chairman or foreman, although it was used somewhat in more institutional contexts. "For instance, the head of a college or university. Oxford and Cambridge had presidents all the way back in the 15th century," Zimmer says. "It was also occasionally used for the heads of colonies, going back to Virginia in 1608. They had a president." In 1774, the presiding officer of the Continental Congress was also called "president," but it was very much a ceremonial title. So Article Two of the Constitution gave the word "president" a whole new meaning. "They were charting new terrain here," Zimmer says. "This title really didn't fit perfectly well." And once George Washington was elected to fill the role, Congress had a bit of a panic about it. "In April of 1789, Washington was making his way to New York City to be inaugurated, and Congress started to have this discussion about how are we going to address him once he gets here?" says Kathleen Bartoloni-Tuazon, a historian with the First Federal Congress Project. The king was "Your Majesty," while governors at the time were addressed as "Your Excellency." What would they call Washington? "[Washington] had been 'General' and 'Your Excellency' as commander of the Revolutionary forces," Bartoloni-Tuazon says. President just seemed too plain to the Senate, and they brainstormed a bunch of alternatives. "Elective majesty, sacred majesty, elective highness, illustrious highness, serene highness," Bartoloni-Tuazon says. "The Senate actually went on record as recommending, 'His Highness, President of the United States and Protector of Their Liberties.' Now that's a mouthful." On the other side, the House was unanimously against anything but president alone. They were afraid that anything more would make the executive leader into a kind of monarch. The debate went on for three arduous weeks — the original Congressional deadlock. "You can even consider this the first dispute between the House and the Senate over constitutional intent," Bartoloni-Tuazon says. In the end, the Senate relented, writing they wished to preserve harmony with the House. Bartoloni-Tuazon, author of a book about this debate, For Fear of an Elective King, says the simple title of "president" established the first principles of the executive branch of the American political system. "Those principles — modesty and a nod to the people — helped the presidency be accepted by the people in that unsettled time," she says. It also served as a model for countries around the world. "Other republics, when they were creating new governments and deciding what to call their heads of state, very often followed this model that the Americans had of naming a president," Zimmer says. "In Latin America, for instance, Haiti had its own president to be the head of its Presidential Republic in 1807, and other countries around the world also followed suit." Today, dozens of countries around the world call their head of state the president.